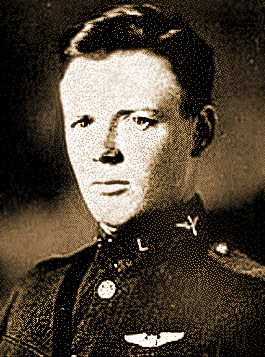 Late in his training Lindbergh experienced his worst flying accident on March 5, 1925 when he was involved in a midair collision eight days before graduation with another Army S.E.5 while practicing aerial combat maneuvers and was forced to bail out. Only 18 of the 104 cadets who started flight training remained when Lindbergh graduated first overall in his class in March 1925 thereby earning his Army pilot's wings and a commission as a 2nd Lieutenant in the Air Service Reserve Corps. With the Army not then in need of additional active duty pilots, however, Lindbergh immediately returned to civilian aviation as a barnstormer and flight instructor, although as a reserve officer he also continued to do some part time military flying by joining the 110th Observation Squadron, 35th Division, Missouri National Guard, in St. Louis in November 1925 and was soon promoted to 1st Lieutenant. Lindbergh enrolled as a flying cadet in the U.S. Army in 1924 and his first emergency jump happened early in flight training. It was from an open cockpit, single-seat SE-5 scout biplane, on March 5, 1925 as a student pilot at Kelly Field, near San Antonio, Texas. "I closed the throttle and saw an SE-5 with Lieutenant McCallister in the cockpit a few feet away on my left. He was apparently unhurt and getting ready to jump. "Our ships were locked together with the fuselages approximately parallel. I removed the belt, climbed out to the trailing edge of the —the ship was then in a nearly vertical position—and jumped backward from the ship as far as possible.